"It is almost universal that whenever there is a driving force for a process, there always is a resistive force," Zhang said. "Here, the driving force is biochemical—the protein-protein interaction." The resistive force is the mechanical energy cost required for the membrane to wrap around the nanoparticle. Until now, bioengineers only considered the driving force and designed nanoparticles to optimize the chemical interactions, a targeting strategy called "chemotargeting." 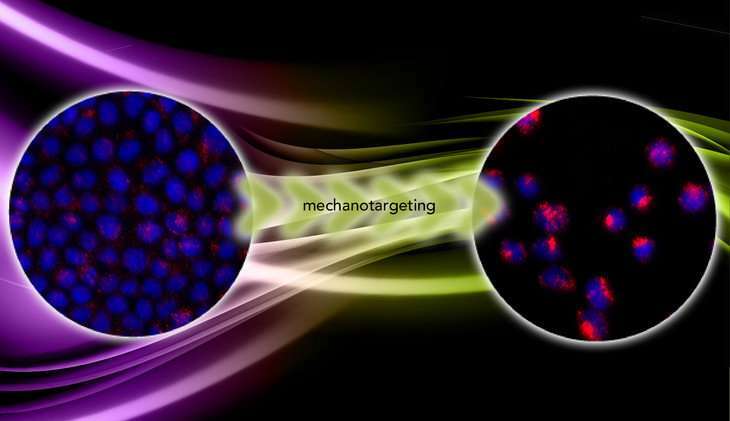 Zhang believes they should also take into account the mechanics of the cells to design nanoparticles to achieve enhanced targeting, which forms a new targeting strategy called "mechanotargeting." "These two targeting strategies are complementary; you can combine chemotargeting and mechanotargeting to achieve the full potential of nanoparticle-based diagnostic and therapeutic agents," Zhang said. "The fact is that targeting efficiency requires a delicate balance between driving and resistive forces. For instance, if there are too many keys on the nanoparticle surface, even though these keys only weakly interact with the nonmatching locks on normal cells, these weak, off-target interactions may still provide enough adhesion energy for the nanoparticles to penetrate the cell membrane and kill the healthy cells." On the other hand, if the adhesion energy is not high enough, the nanoparticle won't get into the cell. In "Mechanotargeting: Mechanics-dependent Cellular Uptake of Nanoparticles," published online ahead of print in the journal Advanced Materials, Zhang and the team report the results of experiments on cancer cells grown on hydrogels of variable stiffness. On soft hydrogels the cells remained cohesive and benign and experienced a nearly constant stress that limited the uptake of the nanoparticles. But on stiff hydrogels the cells became metastatic and adopted a three-dimensional shape, offering more surface area for nanoparticles to adhere, and became less stressed. Under this condition, the cells took up five times the number of nanoparticles as the benign cells. "The nanoparticles are fluorescent, so we count the number of nanoparticles that get into the cell by the fluorescence intensity. We found that in the malignant cells the intensity is five times higher," Zhang said. "That proves that mechanotargeting works."